Release 213: Poles, Beams and Letter Boxes! The update should automatically download on PlayStation 4. Please close and restart Boundless on PS4 to encourage the system to check for an update. Please report all issues discovered with the update with a new post in the #support thread. Introduction and overview video by @Jiivita. Romance is in the air as the Lovestruck event draws near. 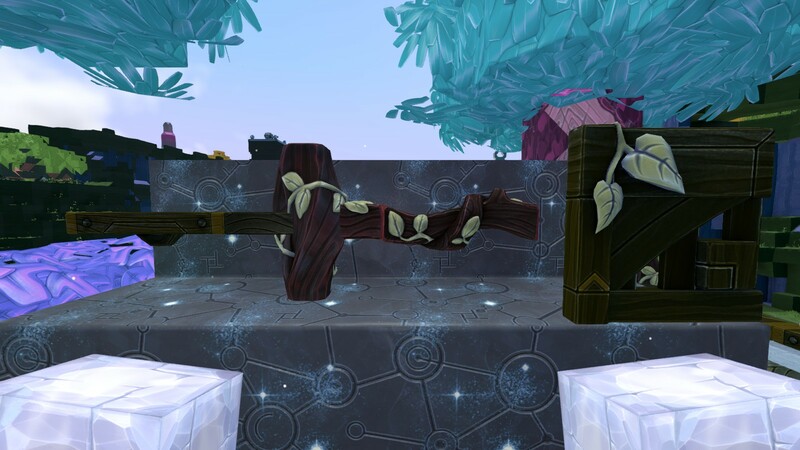 For a limited time try and hunt down as many unique citizens to trade Bunch of Roses to unlock Heart Rocks to craft many new romantically themed items. The exchange has also been loved up, with a new mask and a tattoo for a limited time only to buy! Even the Sanctum is getting ready to join in the festivities this time around! Craft Bunches of Roses by gathering flowers around the game world. Trade Bunches of Roses with as many unique Citizens as you can to transform the Bunch of Roses into a Heart Rock, used for crafting the new Lovestruck objects for your Beacon. Each unique Citizen will only ever grant one Heart Rock, so find as many different people to trade with as you can! A Heart Rock can only be given to each character once. A heart icon will show next to the trade button to show if a Heart Rock has already been traded to the other player. New craftable Lovestruck objects: Heart Balloons, Romantic Stone Column, and the Romantic Vase. The Sanctum and Elder will be showing off a new look just for the duration of the event. Limited time cosmetic options in the exchange to purchase: New Lovestruck and Bow masks and a new Climbing Roses Tattoo. Allow Body Paints to be included in special events. New items, props and customisation options for the Lovestruck event. More details when the event launches. Added a complete set of Poles and Beams! The Poles and Beams come in 4 material types: Wood, Stone, Metal and Gleam. Each material has 3 different tiers of visual style: Standard, Stylish and Ornate. All poles and beams take the colours of their base wood, stone, metal and gleam. The gleam poles and beams emit a little light. Both poles and beams can be place vertically and horizontally based on the surface they’re placed against. They have some new placement logic to assist with making structures. When poles connect to poles, and beams connect to beams they will follow the same orientation. 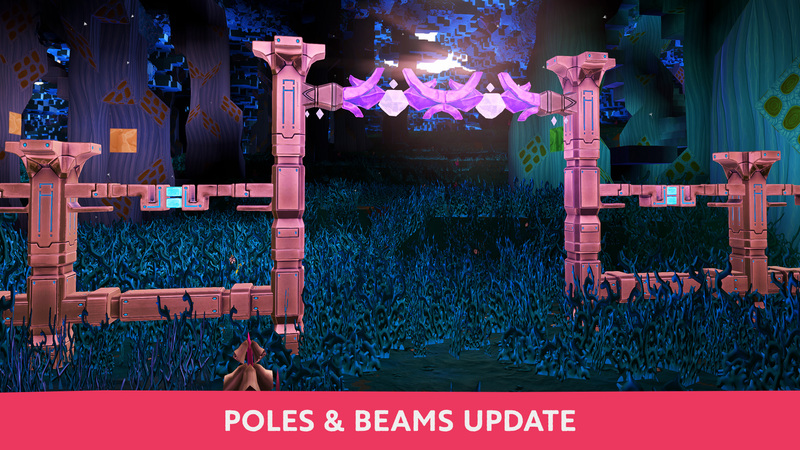 When beams connect perpendicular into poles the beams will automatically extend into the pole voxel so that they’re touching. “Beams extend into Poles” is the rule. The chisel can be used to rotate the poles and beams around their longest axis. Poles and Beams are counted against the limit of 500 meshes per chunk. Added a Letter Box that can be placed in your beacon! Players can interact with any Letter Boxes in your beacon to start sending you Private Messages. The initial message is automatically stamped with the name of the beacon and world to give you context. Once initiated both players can continue to communicate via the messaging system. The Letter Box is designed to initiate communication with the owner of a beacon. Place the Letter Boxes with Signs to give players instructions on the information you want. Health and stamina will be automatically updated to maintain the previous bars ratio when switching between skill sets with different max health and max stamina values. So for example you will no longer need to consume food/brews when toggling between a low health/hunger Crafter build and a high health/hunger Combat build. Added “Block Placement Repeat Delay” which is accessed via the settings menu. The option inserts an additional pause between the first action and subsequent actions when a block placement or chisel action is held down. This option can be set to “None” to replicate the previous full speed placement behaviour. All Crafted solid Rocks (including the new Marble, Gravel and Mosaic Blocks) will now count towards the “Solid as a Rock” feat. This excludes Bricks. Added a new Core Objective for joining a guild. Now players can donate coins directly to the guilds listed on the character screen. Improved the feedback when beacon guild alignment is modified. A guild total prestige now includes the prestige of all its Factions. Removed the “Your Membership” section on the guild overview screen. You can still access the same functionality by finding your character in the members tab. Allow any players with the highest prestige in a guild aligned settlement to rename settlement, independent of their permissions in the guild. This works around a common issue where players align their isolated beacon to a guild and then were unable to rename the guild settlement created. Changed the help text when viewing the player guild membership list to clarify that guild information is not available in the sanctum. Added a protection modal when deleting a guild that includes the current coin and toil that would be lost. Allow new Beacon Controls to be attached to any Factions independent of the Directors membership of the Faction. Guild tags no longer automatically encased within square brackets or automatically capitalised. It’s up to the guild to include [ ] if desired. Guild tags have been added to settlements where relevant. This will help differentiate between guild ownership and player ownership. Small change to how we display faction names in a selection modal. Aligned beacon HUD information will now include the guild tag. Added a new option for Controlled beacons where the footfall is owned by the guild. The coin can then only be withdraw from the beacon by the guild leadership. This open is only really suitable for genuinely shared locations. Beacon footfall collection total info is now available in the guild control beacon list if the beacon is coin controlled. Removed “Coin per Visitor” from the beacon info screens as this information was misleading. This was only a single parameter that went into the footfall calculation and ultimately resulted in confusion about the footfall that should be received per visitor. We plan to rework the presentation of footfall so that it’s clearer that footfall is a Settlement orientated system and not a Beacon system. Only display the beacon coin box if the user has permission to manipulate it. Added tooltip on the Guild Buff machines to explain what Endeavour is. Endeavour generated by a guild member is now shown in the guild membership details. Adding icons onto guild member items to show endeavour and if they have the guild set as their primary guild. Guild Buffs are now “owned” by individual Helix machines instead of globally. If the Helix is removed, if their power is removed, or if the beacon changes alignment then active buffs are cancelled. Added Contextual Hints when the users use the Helix and Guild Control UI. Added a restriction on the helix machines to stop applying guild buffs if the action would wear out the machine’s power coils, because this would intermediately disable the new buff. All guild buff helixes capable of providing a buff will spin whilst that buff is active, rather than just the helix from which it was launched. Adding new option when viewing other player profiles. Adding the ability to Blacklist a player which will permanently mute them. The basic Mute only lasts for a single session. Restarting the game will automatically unmute any muted players. Any message in the chat module. Directly interacting with the player. Blacklisted characters chat and chat bubbles are automatically hidden. Blacklisted characters can’t request trades or friendship. Chat parental controls have been updated to better work with the new messaging system. Added buttons to the player profile screen, guild member dropdown and friend dropdown to open up a private message chat window. Removed confusing options for guild log messages. Tidy presentation of emotes in guild chat. Bolstered the strength of beacon probe maps for atlases and planets in the sky so that low-plot-density settlements will shine brighter and more obviously against the rest of the unplotted planet. Added SFK when manipulating skill points. Added SFX to help communicate resisted attacks. Add status effect removed audio. Improvements to the SFX for status effects. Improved performance when thousands+ of entities are added/removed at the same time. Reduce frame drops from destroying chunk data. Limit the number of VFX played to help maintain frame rate during intense meteorite events. Increase the command buffer size on PlayStation 4 to reduce crashes around meteorite events. Mesh-blocks like surface resources and flowers which are placed onto the ground and offset-down onto sloped surfaces, can now also be chisel rotated. Fixed a bug where chiselling the block beneath mesh-blocks like surface resources and flowers would not offset the mesh (and particles in case of torches) down correctly until the chunk was fully remeshed after walking far enough away and coming back again, or until the torch/mesh was removed and placed again. Fixed some issues with the “View Playstation Network Profile” buttons not bringing up PSN player info. Added more fine grain tracking of client to server latency and improved server side latency tracking. This will be used in the future to present a connection status page for players to review how they connection performance compares to other players. Moved character-backup restoration to occur earlier during server start-up, so any crash bugs hit during start up will not leave characters locked to the world. Improved the performance of handling many pending message requests in parallel. Fix an occasional crash in the sanctum if your world is offline or failing to connect, and you then try to use the other warp to connect to the same world. Fix the main warp in the sanctum outside tutorial having short windows where it is (incorrectly) interactable whilst awaiting an auto-restart to its opening procedure. Fix frame drop when creating chunks which contain many storage blocks and plinths. Fix some client crashes when cancelling a return to sanctum during lag spikes or whilst very close to the 0 timeout. Fixing issues resetting freely your skill page for players below level 20. Fixing presentation issues switching your skill page on the player character screen. Fixed visual glitch with the Well Fed buff when returning to the Sanctum after being defeated. Fixing incorrect message in the action log when a helix machine was hit. Fixing rendering issues for guild buffs listed in the guild buff machine screen. Prevent tools forged with area-of-effect boons from destroying other blocks in the sanctum if you break open the warp manually. Fixed a bug in which the world information dropdown in the places screen became necessarily large. Fixed a rare crash in the places screen. Fixed rare crash when applying a new guild buff. Could place engines too close to the guild buff machines depending on order of placements. Guild buff machines didn’t link correctly with engines when the machine spanned a world-wrap border. Fixed some issues with block lights being left disabled when neighbouring blocks were chiselled to reveal the light source. Fixed a memory leak caused by particle/warp edge effects that could cause crashes after long play sessions around hubs with many portals. Fixed bug where trying to add coin to a request basket would clear a negative coin balance. Updated Wicker blocks to no longer always show HUD info when aimed at. Fixed a case in which gleam club was displayed incorrectly if you had characters on both PC and PS4. Fix crafting beacon location tokens from a guild control to work for beacons that are not on the current world. Corrected spelling on pop up when interacting with Delete Beacon. Fix for friending and trading sometimes getting stuck in a request declined state. After trading players can now stay on the trade complete screen when the other player has closed their trade complete screen. Fix issue where PS4 players could not connect to the world because of very slow DNS lookup. Fixed Places>Worlds tab being empty for new characters without even showing the current world. Fix a rare crash with beacon rendering. Fixed a bug that incorrectly increased gatherer feats when collecting items dropped from destroyed storage containers. Fix for client crash when reporting via the report actions. Fix error loading ContextualTipsData on PS4 which could result in the learned and seen tips being reset. Fixed an issue where some users who upgraded their backing tier were not receiving the upgraded forum badges. Fix for rejecting friend requests while interacting with a block. Fixed Portal and Location Tokens in your inventory being deleted when quitting or travelling through Portals, Warps, or to the Sanctum. Balance pass on footfall focused on increasing footfall to higher traffic beacons and settlements. Fixed grapple reel-in controls not working after being revived. Fixed the broken track player button in the player profile screen. Fix for rare client crash during trading. Fix for PS4 client crash when opening trade button dropdown at the same time as another player trades with you. Fix GUI corruption after opening the settlement details in a settlement with >150 contributors. Fixed a rare server crash related to very long spark links. Allow trading heart rocks once a day after 09:30 UTC on Valentines day. Poll: Are you tired of reading about Footfall and if it broke or not? I haven’t read the notes yet as I’m about to leave for work, but I’m doing shop maintenance right now and let me just say the entire game is feeling extremely responsive and quick. Added release notes for 213.1 hotfix. The settlement name is disappearing when I try to rename them. All of our PS Gateways. I click the settlement to expand it, and it disappears from the beacon control list. I am able to rename the settlement on my personal beacons, but guild controlled beacons have the issue. Hi @James, I noticed something odd, possibly! The Plain Wood Beam and Plain Wood Door, match the style of the Stylish Wood Pole. Could you share some pictures with Heart Shaped Rock or Lovestruck Bouquet? Updated OP with details of hotfix 213.2. Updated OP with details of hotfix 213.3. This fixes the issue that causes the world outage over the weekend - here. Yes! I am trolling through people’s alts trying to get enough hearts! Thanks for this! I think we should be allowed to trade more than one heart at a time. Limit it to three but just one takes too long. Maybe tomorrow will be better and I can get some hearts, I hope so, I gave up after getting six of them, not finding anyone to trade with.